The Mid-East has a reputation for being a hotbed of terrorism, obviously due to a clash of three major religions that frequently makes the evening news. The State of Israel is no exception to this rule, having experienced acts of terroristic violence for well over a hundred years. Prior to the establishment of a Jewish state in 1948, the intention of this bloodshed was to “weaken the spirit” of the Jewish people and thwart the creation of a national homeland, whereas since 1948 the objective has been to destroy the very existence of Israel as a political state. In the words of the Organization of Israel’s Terror Victims, “the front line and home front have become one and have placed the entire country at the frontlines of this bloody battle against terror.” Blunt facts that have been traced back to the year 1920 make this statement brutally true, as evident in research conducted by the American-Israeli Cooperative Enterprise – which lists a total of 3,715 human beings that have lost their lives to acts of terrorism between 1920 and 2012. Professor Gabriel Ben-Dor, director of the Center for National Defense Research in Israel, has presented startling information that contains even more significance to this fact – stating that 1 in 5 Israelis, or about 1.27 million people, have lost someone to acts of terror. Therefore, it is no accident that the State of Israel has taken efforts to reach out to families that have lost loved ones, making sure that the memory of the fallen is preserved forever. The Organization of Israel’s Terror Victims was established specifically for that purpose, with the mission to “assist the victims of terror in their effort to continue with their lives and bear the social, financial, cultural and spiritual burden of their daily struggle and personal survival following the tragic experience.” Uniquely reaching out to this huge segment of society, this organization established a monument specifically dedicated to the remembrance of those that have died at the hands of terrorists. 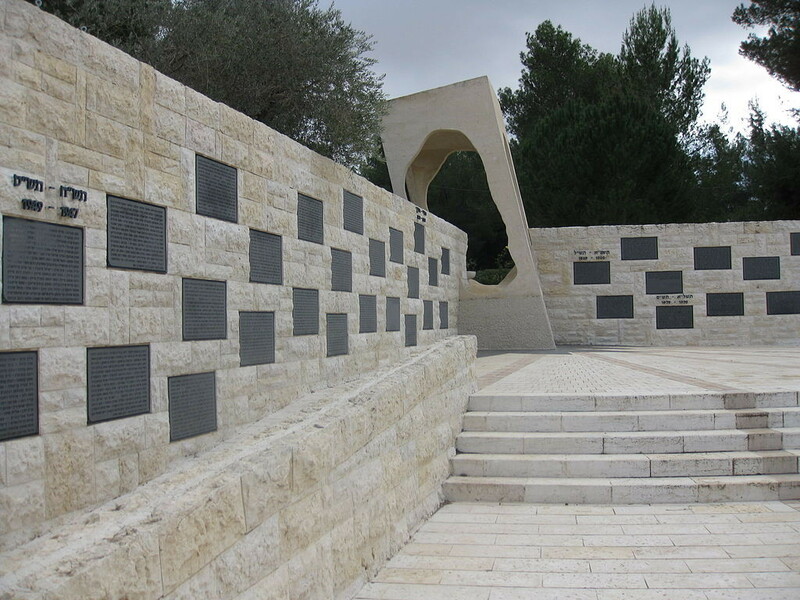 The Victims of Acts of Terror Memorial, established in 1998, is but one part of a large national site of commemoration located on Mount Herzl, which lies on the western side of Jerusalem close to the Jerusalem Forest. 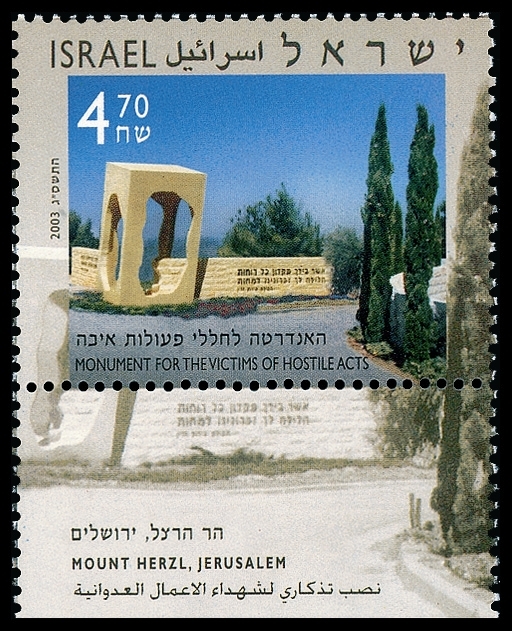 The mount is named after Theodor Herzl – founder of modern Israel – and the location of Yad Vashem, the national monument dedicated to the Holocaust. Herzl’s tomb lies at the very top of the mount, and Yad Vashem contains the Holocaust History Museum, the Children’s Memorial, the Hall of Remembrance, and the Museum of Holocaust Art. Similar to Arlington National Cemetery, there is also a national burial ground located on Mount Herzl dedicated to Israel’s war dead. As a sign of the deep respect the State of Israel bestows on victims of terror, the official day of remembrance now has the designation as the “Remembrance Day for Fallen Soldiers and the Victims of Terror.” In this obvious manner, those that have fallen in acts of terrorism are held in the same respect as soldiers that have fallen on the battlefield. As an even deeper indication of this esteem, in April of 2012 the Israeli Cabinet approved the construction of the Hall of Names Memorial, which “will list the 22,993 names of those who have been killed fighting in Israel’s declared and undeclared wars and those slain in terrorist attacks.” The names of those to be honored will be permanently etched on brick. “Thus said the Lord: A voice was heard in Ramah, lamentation and bitter weeping, Rachel weeping for her children refusing to be comforted for her children, because they are not. Thus said the Lord: Refrain your voice from weeping, and your eyes from tears; for your work shall be rewarded, said the Lord; and they shall come again from the land of the enemy. And there is hope in your end, said the Lord, and your children shall come again to their own border” (Jeremiah Chapter 31, verses 15-17). Those that support this website believe it is time for such a monument in the United States, a country that has also lost thousands to acts of terror. But you can communicate your opinion through our poll, which you will find below. This entry was posted in Posts for the Cause and tagged Architecture, DIY, human-rights, libya, memorials, middle-east, monuments to the fallen, monuments to victims of terrorism, national pride, Politics, religion, terrorism, terroristic violence, world brotherhood, World News. Bookmark the permalink.